(Reuters) - Bank of America Corp's loan growth lagged rivals and fees from advising on deals and underwriting bonds fell in the third quarter, sending its share price 1.7 lower even as profit beat expectations. The No. 2 U.S. bank's profit rose 35 percent, helped by cost controls, but investors focused on the underlying businesses. "It was definitely a surprise when some of the other banks had better-than-expected loan growth," said R.J. Grant, head of trading at Keefe, Bruyette & Woods. Bank of America's total loan book grew 0.3 percent to $930 billion during the third quarter compared with the year-ago period. Declines in mortgages and loans to customers of its markets business offset gains in consumer banking, wealth management and commercial loans. By contrast, JPMorgan Chase & Co reported a 6 percent rise in loans and Citigroup Inc reported a 4 percent increase. Bank of America shares were 48 cents lower at $27.98 shortly after midday. The fees it generates from advising on mergers dropped 26 percent in the quarter, as did those from underwriting bond offerings. Its sales and trading revenue fell 5 percent. "I know we can do better," said Donofrio. Lenders in general are benefiting from a strong U.S. economy. Rising interest rates, lower taxes, buoyant deposits and healthy loan demand have boosted the industry this year, with some big banks reporting record profits quarter after quarter. Bank of America's third-quarter profit jumped to $6.7 billion from $5 billion a year earlier. Excluding special items, the bank earned 67 cents per share, compared with an average analyst estimate of 62 cents per share, according to I/B/E/S data from Refinitiv. "Overall trends continued to look strong," Citigroup analyst Keith Horowitz said in a report. "Underlying core results (are) not necessarily as strong as headline number though." Revenue rose 4 percent as non-interest expenses fell 2 percent. Thanks to its efficiency efforts, Bank of America's costs have been rising less or falling more than revenue for the past 15 quarters. The bank plans to keep annual costs at roughly $53.5 billion through 2020, Donofrio said in a separate call with analysts. That compares with more than $80 billion in costs representing 85 percent of revenue in 2011, the year Moynihan first unveiled an efficiency program dubbed "Project New BAC." 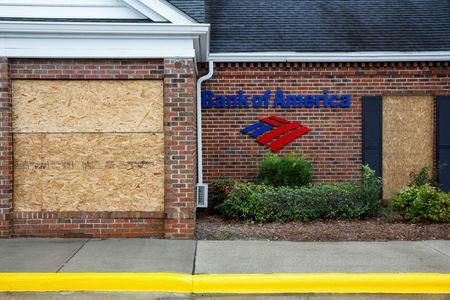 In the first nine months of this year, Bank of America's ratio of costs to revenue was 59 percent. That compares with 57 percent at JPMorgan Chase & Co, 58 percent at Citigroup Inc and 65 percent at Wells Fargo & Co. Asked on the call whether Bank of America can get its cost ratio to the mid-50s in percentage terms, Moynihan said: "We should keep pushing it down."